Have you ever felt like you are the only "normal" one left? Are you maybe the only one in your family who educates their children at home? Are you the only homeschoolers in your church? Maybe you are the only ones in your community. When you abandon the ideal of traditional education you veer into (what is perceived by others) as weird territory? Sometimes I have just thrown my hands up to my husband and said, "Are we the only NORMAL ones left?" Are you maybe the only one in your family who homeschools? Are you the only homeschoolers in your church? Maybe you are the only ones in your community. At our very first Great Homeschool Convention, we listened to a panel of Classical educators moderated by Andrew Kern. In Australia there was a rugby match where all of the players were naked. In the middle of the game, a fully clothed spectator went running across the field. Sometimes it seems as if WE, as homeschoolers, are that fully clothed spectator. Everyone on that field looks a certain way - and then we run across looking DIFFERENT. We get the feeling that being the only normal one left is weird, but as individuals who are convicted to home educate we must stay the course and do what we know is best for our own children. After all, this new "normal" of compulsory schooling and assembly line education hasn't been around all that long. Educating your children at home used to be the way things were done. Thinking deep thoughts about worthy ideals used to be in vogue. Reading REAL books used to be the norm. This story hit home with my husband and I at the convention. It really hit home, however, just a few days later. In a series of unrelated events, we received criticism of our choice to homeschool (directly and indirectly). We were LONG past caring what others think of our decision to homeschool. After many years of doing this we KNOW this is the best path for our children, just as a parent that sends their child to school knows the best path for their child. After all, we shouldn't do things to please others. We do not believe in conforming to the world. I didn't realize just how far we had evolved in our thinking until just recently. I was put in a position to articulate why we homeschool to a critic. After all, I consider myself a homeschool ambassador. I tried to pepper my words with grace and a remembrance of the time when I didn't quite understand why in the world someone would want to HOMESCHOOL. People criticize what they don't know or understand, and sometimes what intimidates or threatens them. When someone takes the time to criticize our decision as homeschoolers it tells me they either have too much time on their hands, or are woefully uninformed. I know, because this was once the way I behaved. So my friends, the next time that neighbor, family member, or "friend" criticizes you (either to your face or behind your back), please remember the naked rugby tournament. "Their children are so sheltered they won't be prepared for the real world. How are they going to learn to relate to other kids their own age? " "You don't let your kids watch cable?" "Aren't you depriving the world of what your child has to offer?" - please remember what you are doing takes courage, sacrifice, and an obedience many people do not understand. When I look at this picture, I remember a time when we were at a crossroads. My daughter had been crammed into the historically under-served "middle" in her public school classroom. Her once enthusiastic learning spirit had been squashed little by little. She didn't want to go to school because of a few mean girls in her class. She was only allowed to choose books from a certain shelf in the library because they were at her "reading level" (I knew she could read harder material, but they didn't give her the chance.). My son was thriving in a four year old preschool program at our church. I was literally sick thinking about putting him in public school Kindergarten and watching him go through the same equalization process. He was so very bright and precocious, too - if he didn't get a very patient, loving teacher he would probably spend the entire year in time out. "Schools are built for the adults that work in them, not the children." Someone suggested I read Weapons of Mass Instruction. That is when we just knew we had to make a change. We needed to return to NORMAL. I wish I would have known then what I do know about choosing to homeschool. It isn't our job to make the critics understand; it is our job to raise these precious souls that have been entrusted to us in the best way we know how. What we are doing by home educating our children is so normal it just appears weird. I like to meditate on these verses often. They keep me grounded and thankful. We are running a most worthy race, and if we persevere, we will lack nothing. Remember - it's ok to look "weird" - you know you're really NORMAL. I've written an eBook chock full of encouragement, helpful advice, and so much more -- these are words from a former public school teacher, administrator, and parent. 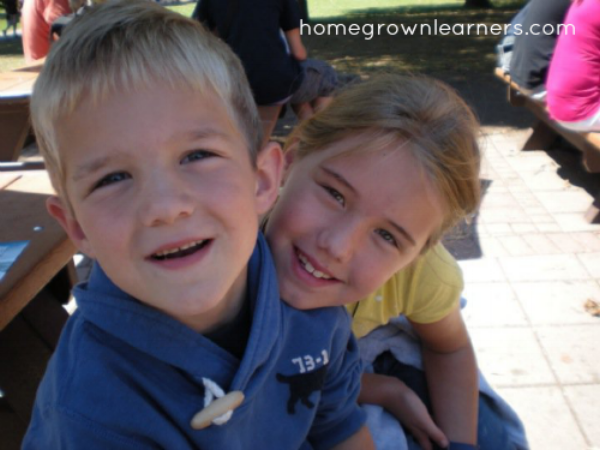 These words are born out of a need to help other parents in their homeschool endeavors. This is our journey to being WEIRD. I'd love to hear your story about being WEIRD. Leave it for me in the comments below!